Designed specifically for your child's age & stage. Includes ideas for how to find more use for the product as your child ages. Each month's item is designed & reviewed by experts to provide maximum benefit to your child's development. Research-based answers to parenting questions. Learn about the concepts and skills that are highlighted this month. Interesting information on a child development topic. Tips for boosting language and literacy development. Activities to try at home related to this month's theme. Articles, links, and videos about child development topics approved by our partners at Seattle Children's Hospital. Ideas for more theme-related activities, printables, and projects. Theme-related book suggestions to add to your library. Beautiful illustrations to engage and inspire your little readers in storytelling. Thick board book pages designed to withstand toddler wear-and-tear. A bookmark with a useful reading tip or activity related to the story is included with every book. Explore and learn about the people and places that can be found in neighborhoods! 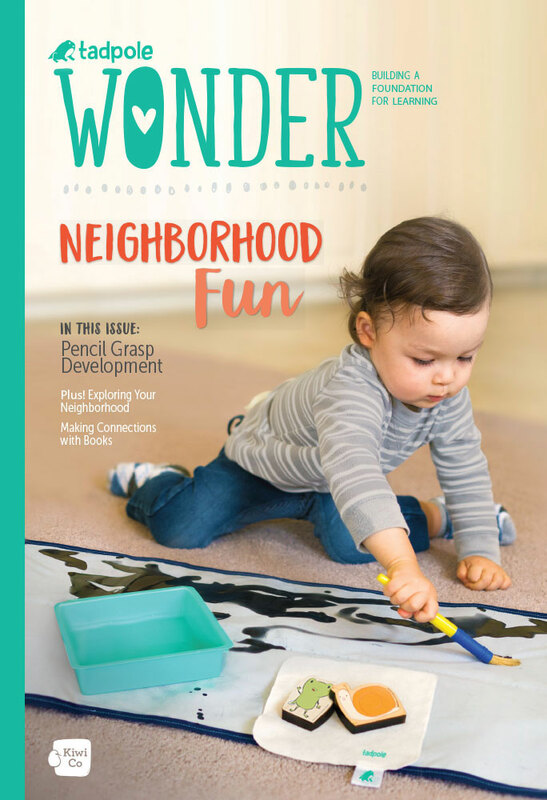 Help your little one engage in pretend play and strengthen their fine motor skills as they paint and stamp on a whimsical neighborhood water play mat. 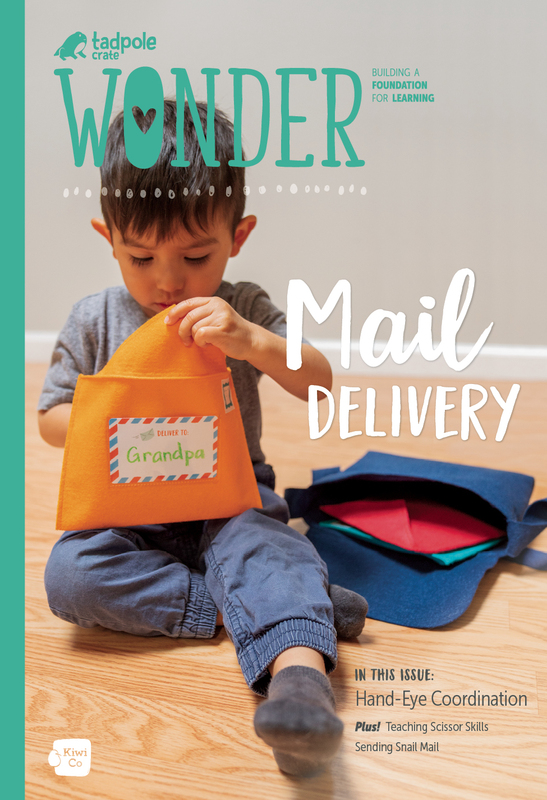 Introduce your little one to the thrilling experience of sending and receiving good old-fashioned snail mail! While creating mail and putting together a mailbag, your child will strengthen their hand-eye coordination with scissor-cutting, tracing, and folding activities. Help your toddler develop essential early science and math skills. Make colorful stained glass sea creatures, and match and sort sea creatures into groups by color and type. Your child will learn about different ocean animals while strengthening their reasoning and inquiry skills, too! Appropriate for your baby's age! Products and information that grow with your baby or toddler. Delivered right to your door, every month. Educational materials backed by child development experts. Designed to lay the foundation for lifelong learning. A portion of every Tadpole Crate purchase is donated toward research about child development. Choose your subscription length and you'll receive fresh crates every month. Your child will receive new projects that will build their foundation for lifelong learning. Tadpole Crate delivers information, inspiration, and products that support your child's healthy development and lifelong learning. We believe that children are naturally curious and creative, and learn by playing, exploring, and most importantly, through interactions with the significant adults in their lives. We've designed Tadpole Crate to be grounded in the science of early childhood, but made helpful, practical, and convenient. We're delighted to be working with the experts at Seattle Children's Hospital to bring you research-backed techniques to support your child's healthy development. We're grateful to play a part in this journey with you! Targeted at a child’s earliest years, Tadpole Crate delivers information, inspiration and high-quality products that encourage the development and creativity of your child. 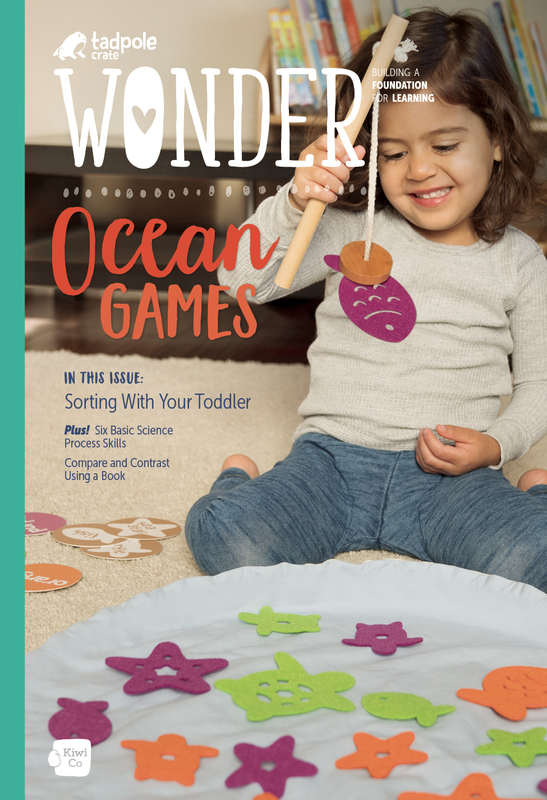 Every month, we deliver engaging projects and content catered to your child’s development stage—all backed by research. We offer fresh ideas for you to encourage development of your child’s skills and bond with him or her. Tadpole Crate is designed by our team of in house experts, which include former educators and child development professionals, along with our partners at Seattle Children's Hospital who specialize in child health, behavior and development. Additionally, every crate is rigorously tested with babies and parents to ensure the crates are age-appropriate, engaging and universally appealing. What countries does Tadpole Crate ship to? Can I give Tadpole Crate as a gift? Yes, Tadpole Crate makes a wonderful gift! When you purchase you can select that it is a gift and have the opportunity to write a gift message (optional). Additionally, we include a message with the first crate that lets the recipient know they have been gifted a Tadpole Crate subscription of either 1, 3, 6, or 12 months so they know how many crates they will be receiving. You can choose to have the first crate sent to your address, so you can present it in person and then have the subsequent crates sent directly to the gift recipient. Of course, you can also choose to have all of the crates sent to the gift recipient. Either way, your gift will be enjoyed for months to come! What age ranges are Tadpole Crates available for? Within the next few months, Tadpole will be available for children 0-36 months. Presently, we are only shipping for the 19-36 month age range. Once you enter the child's age you will see when the crates will be available to ship if the child is 0-18 months old. When does Tadpole Crate ship? If your child is 19-36 months old, we will try to ship the first crate of a new subscription within 2-3 business days of purchase, unless the recipient already has an active subscription. If your child is 0-18 months old, your crate will ship as soon as we launch these new crates. You will see the ship dates for 0-18 month-olds after you enter the child's birthday. Afterwards, crates will continue to ship every month for the duration of your subscription. U.S. customers can check the status of shipments on your My Account page once a crate has shipped. Currently, tracking is not available for Canadian subscription shipments. How is Tadpole Crate tailored to the age of my child? Tadpole Crate is tailored to correspond to the child’s age and stage. We request the child’s birthday upon enrollment, and then we ship an appropriate crate corresponding to the date you select to start sending the crates. US customers can check the status of shipments on their My Account page once a crate has shipped.